I have been asked to explain the wording of penalty statements, marked with an asterisk, underneath some of the 34 Rules of Golf. Such statements appear under Rules 1, 4, 6 and 18. *In the case of a serious breach of Rule 1-2, the Committee may impose a penalty of disqualification. Rule 1-2 covers situations where a player exerts influence on a ball in motion, or intentionally alters physical conditions with the intent of affecting the playing of a hole (e.g. by deliberately creating spike marks on another player’s line of putt). A player is deemed to have committed a serious breach of this Rule if the Committee considers that a player’s action has resulted in themselves or another player obtaining a significant advantage, or being placed at a significant disadvantage. One penalty statement under Rule 4 relates to the different penalties that are incurred, depending on when during a round the breach is discovered (e.g. 1st, 2nd or subsequent holes). Another relates to the requirement that any non-conforming club, or club(s) carried in excess of the permitted maximum of fourteen, must immediately be declared out of play by the player to their marker or a fellow-competitor in stroke play, or their opponent in match play. If the player fails to do so, they are disqualified. There is more information on these penalties at these blogs of mine; re conforming clubs - Rule 4-1, re damaged clubs - Rule 4-3, re maximum of 14 clubs - Rule 4-4. *If a player incurs the general penalty for a breach of Rule 5-3, there is no additional penalty under this Rule. So, if a player claims that their ball is unfit for play and continues play of the hole with a different ball, if it is subsequently ruled that the original was not, after all, unfit for play, the player incurs the general penalty for the breach of Rule 5-3, but not an additional penalty for wrongly substituting a ball. *A player having more than one caddie in breach of this Rule must immediately upon discovery that a breach has occurred ensure that he has no more than one caddie at any one time during the remainder of the stipulated round. Otherwise, the player is disqualified. *If a player incurs the general penalty for a breach of Rule 6-8d, there is no additional penalty under Rule 6-8c. Rule 6-8d details the procedure that players must follow when they resume their round following a suspension of play. If they do not follow this procedure they incur the general penalty of two strokes in stroke play, or loss of hole in match play. Rule 6-8c states that if a player lifts their ball without a good reason to do so, fails to mark the position of the ball before lifting it or fails to report the lifting of the ball, they incur a penalty of one stroke. However, the statement under the Rule, which obviously only applies to stroke play, limits the penalty to a total of two strokes, even if the player has breached both Rules. 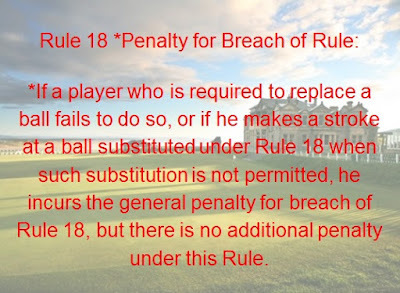 *If a player who is required to replace a ball fails to do so, or if he makes a stroke at a ball substituted under Rule 18 when such substitution is not permitted, he incurs the general penalty for breach of Rule 18, but there is no additional penalty under this Rule. The penalty for a player causing their ball at rest to move, other than as a result of their stroke, is one stroke in both stroke play and match play. However, if the player’s ball is not subsequently replaced at the right spot and the player makes a stroke at it from this wrong place, the penalty increases to the general penalty, which is two strokes in stroke play or loss of hole in match play. 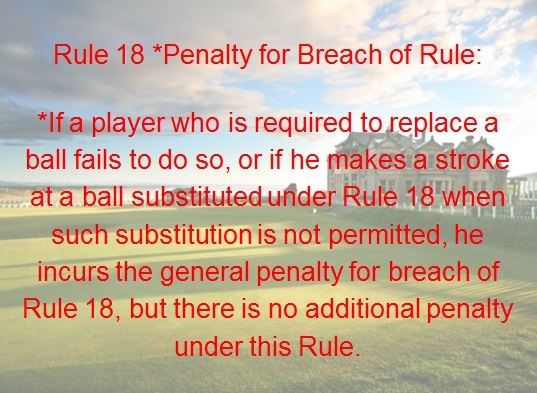 Another example of how this penalty statement applies under Rule 18 is when a player, frustrated with a poor shot, picks up their ball and throws it into a nearby lake, from where it cannot be retrieved. The player then places another ball on the spot from which the original ball was lifted and holes out. The incorrectly substituted a ball under Rule 15-2, incurs a penalty of two strokes in stroke play, but the effect of the penalty statement is that they do not incur an additional penalty stroke for lifting their ball without authority. Three quick reminders; (i) My two '999 Questions' books are available for purchase here, (ii) You can subscribe for my free, weekly 'Rhodes Rules School' emails here, (iii) You can receive my blogs on the Rules (usually fortnightly) by entering your email address in the 'Subscribe vis email' box at the top right corner on any of my blog pages.